With the Porsche 911 GT3 RS 4.0, one of Dr. Ing. h.c. F. Porsche AG, Stuttgart's most popular, coveted and successful racing pedigree production cars is entering the home straight. 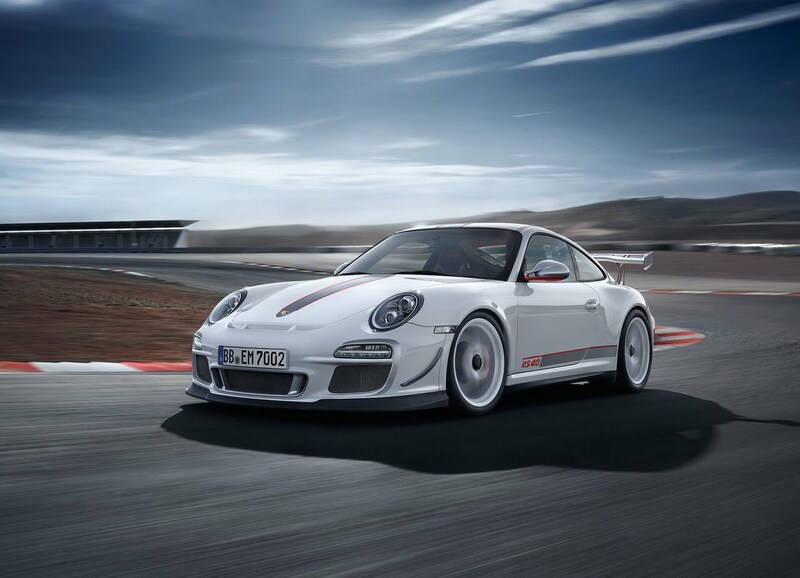 Limited to 600 vehicles, the Porsche 911 GT3 RS 4.0 brings together in a road car all the attributes that have made the Porsche 911 GT3 a serial winner on the race track. The new 911 GT3 RS 4.0 is a thoroughbred vehicle, uncompromisingly optimised for handling, with the performance of all vehicle components, including the suspension and aerodynamics, specially synchronised. Its true performance potential is especially evident on racing circuits: It makes it round the Nürburgring-Nordschleife in 7:27 minutes. With its gearing designed for the racing circuit, the Porsche 911 GT3 RS 4.0, available exclusively with a six-speed sports transmission, reaches the 200 km/h (124 mph) mark in under 12 seconds. The Porsche 911 GT3 RS 4.0's outstanding driving dynamics are the fruit of meticulously coordinated details. In addition to using the suspension components typically encountered in motor racing, weight reduction is also of supreme importance. Equipped as standard with lightweight components such as bucket seats, bonnet and front wings made of carbon fibre, plastic rear windows and weight-optimised carpets, the two-seater's ready-for-road weight is a mere 1,360 kilograms with a full tank of fuel. At 2.72 kg/hp, the Porsche 911 GT3 RS 4.0's power-to-weight ratio thereby dips below the magical threshold of three kilograms per hp. 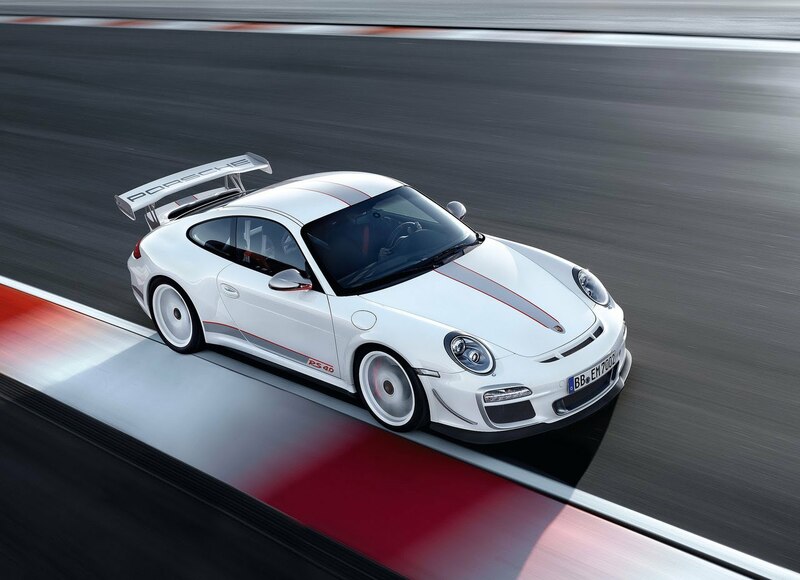 The limited 911 edition is painted white as standard and emphasises its proximity to motor racing by its dynamic appearance. Trademark characteristics are the wide track, the low vehicle position, the large rear wing with adapted side plates, the typical central twin tailpipe and the aerodynamically optimised body. The lateral front air deflection vanes, socalled flics, making their first appearance on a production Porsche, testify to the aerodynamic precision engineering. They create increased downforce on the front axle and together with the steeply inclined rear wing bring the vehicle into aerodynamic equilibrium. The most powerful naturally aspirated engine of all the 911s The Porsche 911 GT3 RS 4.0's six-cylinder, naturally aspirated engine saw the light of day under the tutelage of the Porsche engineer team, also responsible for racing car development. The four-litre engine offers motorsport technology to its innermost core. The flat engine's crankshaft has been lifted unchanged from the 911 GT3 RSR racing car's six-cylinder engine and the forged pistons' connecting rods are crafted from titanium. True to the highrevving concept, the engine is designed with a short-stroke; with a bore of 102.7 mm each cylinder's stroke is 80.4 mm, thus ensuring a compression ratio of 12.6:1. The four-litre displacement sports engine, the biggest ever sports engine in a production 911, is Porsche's most powerful naturally aspirated engine with 125 hp/litre (92 kW). It achieves its maximum power of 368 kW (500 hp) at 8,250 revs per minute. The maximum rpm is 8,500. The engine delivers its maximum torque of 460 Newton metres at 5,750 rpm. 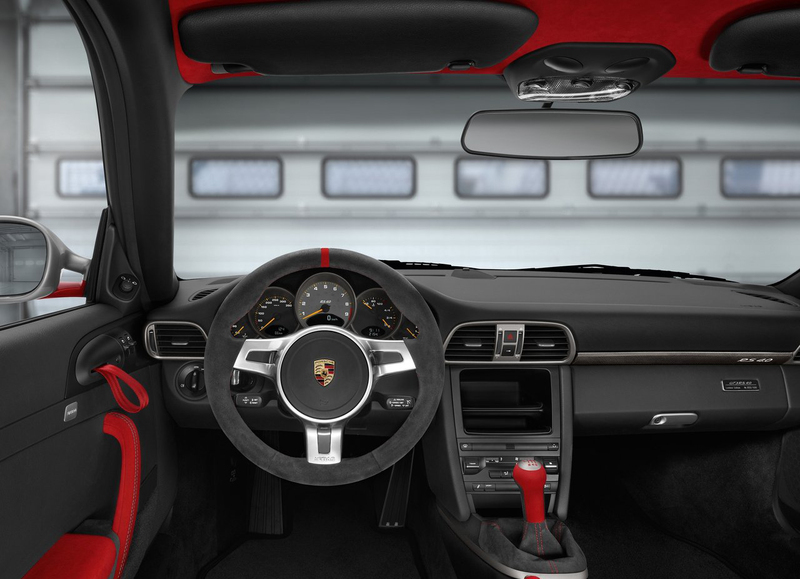 The new Porsche 911 GT3 RS 4.0 is also fitted as standard with a sport button in the front centre console. Pressing this button increases the torque in mid-range engine speeds by up to 35 Nm. But the maximum torque remains unchanged. The increase in torque is achieved by additionally reducing the exhaust back pressure in the sports exhaust system and the associated improvement in the gas cycle. The six-cylinder engine is rigorously optimised for uncompromising agility and high revving. This includes the use of a single-mass flywheel that makes the engine rev faster, thus exploiting an additional acceleration potential. This single-mass flywheel offers a weight advantage of over eight kilograms compared with the 911 GT3's dual-mass flywheel. Other important features are the dry-sump lubrication with external engine oil reservoir, the specially developed VarioCam valve control on the inlet and outlet camshafts with small and high rpm-resistant bucket tappets, a variable intake system with two tuning flaps and a reduced back pressure sports exhaust system. The Porsche 911 GT3 RS 4.0's intake system is characterised by the short manifold with its large cross-section and conical geometry and the special air filter housing made of especially lightweight carbon surface finish. The air filter originates from the 911 GT3 R Hybrid racing car and is an all-new development with more than a ten percent reduction in intake resistance. This is achieved by large twin-flow inlets, the aerodynamic outflow to the mass air flow sensor and the use of two filter cartridges derived from the motorsport world. These slightly conically shaped filter cartridges have a large filter area and a thin filter paper that offers little resistance to airflow. The exhaust gases exit the six-cylinder engine through fan-type exhaust pipes, catalytic converters and reduced back pressure silencers, thus comfortably complying with the Euro 5 emission limit values. This engine was originally based on the power unit of the successful Porsche GT1 racing car that won the 1988 Le Mans race. This engine was refined over several generations of 911 GT3 and in the 911 GT3 RS 4.0 represents the ultimate development for a Porsche 911 performance vehicle with naturally aspirated engine and road use licence. The Porsche 911 GT3 RS 4.0 is exclusively available with a six-speed manual transmission optimised to achieve short gate travel, low weight and high efficiency. To enhance performance, gears one to five have an approximately eleven percent lower gear ratio relative to the 911 GT3. This makes for a favourable power pick-up after the gear change, thereby tapping into an additional potential reservoir of acceleration. This is also catered for by a reinforced clutch pressure plate. 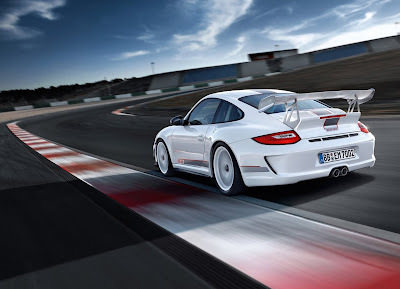 The gear ratio of the sixth gear is also reduced by five percent relative to the GT3. This gearing deliberately sacrifices a higher top speed in favour of increased performance on the racing circuit. The Porsche 911 GT3 RS 4.0's engine is complemented by an asymmetric effect mechanical rear differential lock. The locking values are 28 percent in traction and 40 percent in propulsion, offering both high traction on changing road surfaces as well as precise handling in corners when pushing the driving dynamics boundaries, especially under changing loads. As a sports car that is uncompromisingly designed with driving dynamics in mind, the Porsche 911 GT3 RS 4.0 features a chassis specifically tuned for performance. The new high performance sports car is fitted as standard with the Porsche Active Suspension Management (PASM), a sportily tuned variant of the Porsche Stability Management (PSM) system that can be deactivated in two stages, as well as dynamic engine mounts. 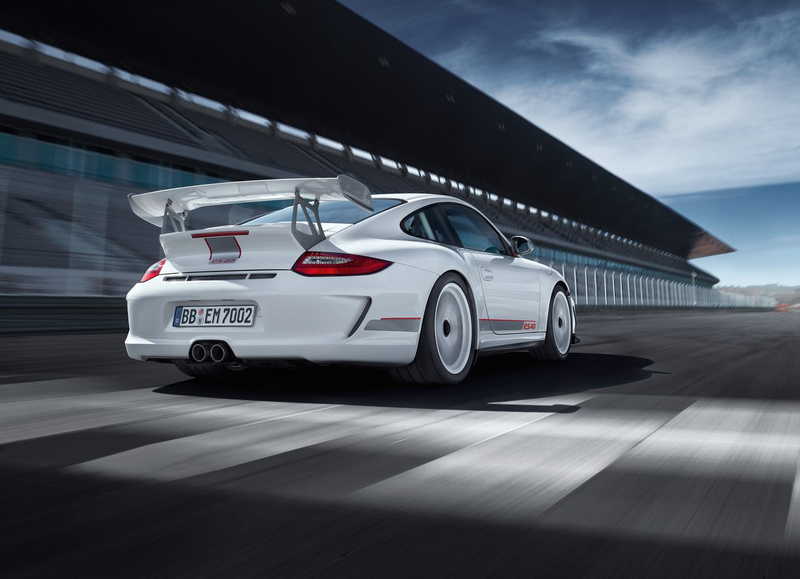 To enhance performance, the new Porsche 911 GT3 RS 4.0 features an especially light and sportily precise chassis. All wheel-bearing components are made from lightweight aluminium. An additional weight advantage is generated by the increased coil pitch, front axle spring setting as well as the use of additional springs - so-called "helper springs" - on the rear axle. They are located towards the bottom of the spring element, thus enabling the use of a short and light main spring. At the same time, they ensure the initial tension of the main spring in a fully rebound state. This design is widely encountered in motor sport and is employed in all 911 GT racing cars. Lower wishbones, tie rods and the tie bar connections on the body and the spring strut on the wheel carrier are fitted with ball joints. They offer even greater precision than normal elastokinematic bearings. With the new 911 GT3 RS 4.0, as with all 911 GT models, in addition to the track it is possible to customise the stabilisers as well as the spring system, including vehicle height, to achieve the desired handling characteristics on racing circuits. To increase stability, not only has the rear axle track width on the new 911 GT3 RS 4.0 been designed to be especially wide, the same applies to the front axle as well. The bene fits: Even more agile steering behaviour and even faster cornering speeds. The Porsche 911 GT3 RS 4.0 is fitted with wheels with central locking and especially high lateral adhesion tyres for even better racing circuit performance. Nine inch wheels with 245/35 ZR 19 size sports tyres are fitted on the front axle. The rear axle is fitted with twelve inch wheels running on 325/30 ZR 19 tyres for high traction and transverse force potential. The air pressure in all four tyres is permanently monitored by the tyre pressure monitoring system (TPMS) fitted as standard. The PSM's custom tuning also satisfies even extremely sporty drivers' handling requirements. Its independent control algorithm that can be completely deactivated in two stages, was specially developed for sporty use on racing circuits. The dynamic engine mounts fitted as standard also contribute to the superior driving dynamics. Depending on the driving situation, the mounts change their stiffness and damping, ensuring that the engine is clamped almost rigidly to the body when being driven with a very dynamic driving style. The GT3 RS 4.0's high-performance brake system comprises six-piston aluminium fixed caliper brakes at the front and four-piston aluminium fixed caliper brakes at the rear. All brake calipers are painted red. To reduce weight, all four composite disc brake hubs are made of aluminium. The disc brake diameter on the front axle is 380 millimetres and 350 millimetres on the rear axle. The discs are internally ventilated and perforated. The PCCB brake system is available as an option; the ceramic disc brakes are of the same diameter. To ensure braking power under high stresses, in addition to intensive brake ventilation on the front axle the Porsche 911 GT3 RS 4.0 also features brake ventilation on the rear axle. This involves special brake air ducts fitted laterally on the underbody directing cooling air to the rear brake system. Also available as an option are the pneumatic lifting system for the front axle, which enables the front-end of the car to be lifted by approximately 30 mm as well as a 90 litre capacity long-range tank. The new 911 GT3 RS 4.0's motor racing influences are clearly apparent from the body, which boasts two important characteristics: It is particularly light and is aerodynamically particularly sophisticated. The Porsche 911 GT3 RS 4.0's ready-for-road weight is 1,360 kilograms. That equates to a dry weight of approximately 1,280 kilograms. That means that the new road racer is only approximately 80 kilograms heavier than a GT3 racing car. The rigorous weight reduction can be seen in numerous details. As with all 911 sports cars, extensive use is made of aluminium, both the Porsche 911 GT3 RS 4.0's front wings are made of carbon fibre as is the bonnet. Both the rear window and rear side windows are made of lightweight polycarbonate. The rear centre panel adjoining the rear window is made of glass fibre-reinforced poly urethane and the rear lid of glass fibre-reinforced plastic (GRP). Both driver and front seat passenger are accommodated in particularly lightweight bucket seats; the floor is clad with weight optimised carpets. An additional weight reduction option is the lithium-ion technology starter battery, which Porsche is the first car manufacturer to offer. Weighing less than six kilograms, the storage battery is more than ten kilograms lighter than a conventional 60 Ah lead battery. The lithium-ion battery is delivered with the vehicle and can be substituted for the conventional, standard starter battery. By delivering both batteries the vehicle is ready for use throughout the year because although the lightweight battery is very serviceable for everyday use, its starting ability - because of its specific characteristics - is limited at outside temperatures below zero degrees Celsius. The Porsche 911 GT3 RS 4.0's motor racing bent is immediately recognisable from its aerodynamic design. The 911 GT3 RS 4.0 is the first Porsche production sports car to feature so-called flics, or air deflection vanes, mounted on the side of the front apron. In terms of their basic function they can be traced to motor racing, are aerodynamically highly effective and increase downforce on the front axle. 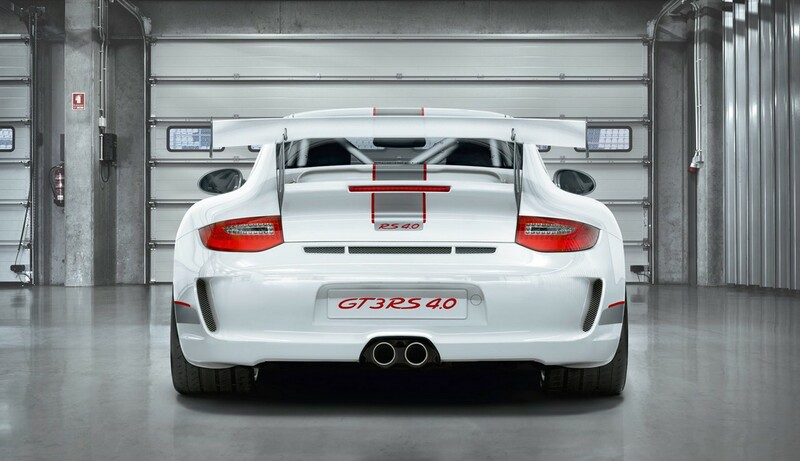 The large fixed rear wing is a traditional feature of the 911 GT3 RS models and provides downforce on the rear axle. In the case of the new 911 GT3 RS 4.0 it is painted in the same colour as the car and features special side plates that provide aerodynamic compensation for the front end flics. As a result, at top speed, aerodynamic forces exert an additional 190 kilograms pushing the Porsche 911 GT3 RS 4.0 onto the road. As a result, the 911 GT3 RS 4.0 offers yet higher acceleration potential for even higher cornering speed on racing circuits. The front end of the Porsche 911 GT3 RS 4.0 continues to be defined by the Bi-Xenon headlights fitted as standard, LED technology day running and position lights, the large air inlets and additional air outlet forward of the luggage compartment lid. The central, slightly protruding cooling air intake in GT metallic silver is particularly striking. Its slight wedge shape enhances aerodynamic efficiency and, together with the integrated cooling air duct and exhaust air opening forward of the luggage compartment lid, promotes aerodynamic downforce on the front axle. This effect is assisted by the bold contours of the black polyurethane front spoiler lip. Other characteristic features are the air inlet and outlet grilles painted in a titanium colour and the widely-protruding exterior cooling air inlets. With the new Porsche 911 GT3 RS 4.0 the size of the air inlets and vehicle's width are further emphasised by a sickle-shaped decorative strip in GT metallic silver around the side air inlets and front lights. This is complemented by a decorative strip in GT metallic silver running centrally around the entire vehicle edged in red, beginning with the Porsche badge on the luggage compartment lid and ending on the red "RS 4.0" model lettering on the rear lid. The motor racing orientated interior equipment with red Alcantara highlights is entirely in keeping with the new 911 GT3 RS 4.0's intended purpose. For example, lightweight door panels with traditional door opening straps, a specifically GT3 SportDesign steering wheel with red centrally positioned markings and various carbon elements are used. For example, the door entry guards are made with a carbon finish. The Clubsport package comprising roll-over bar, fire extinguisher, six-point racing harness and flame-retardant seat covers is fitted as standard. 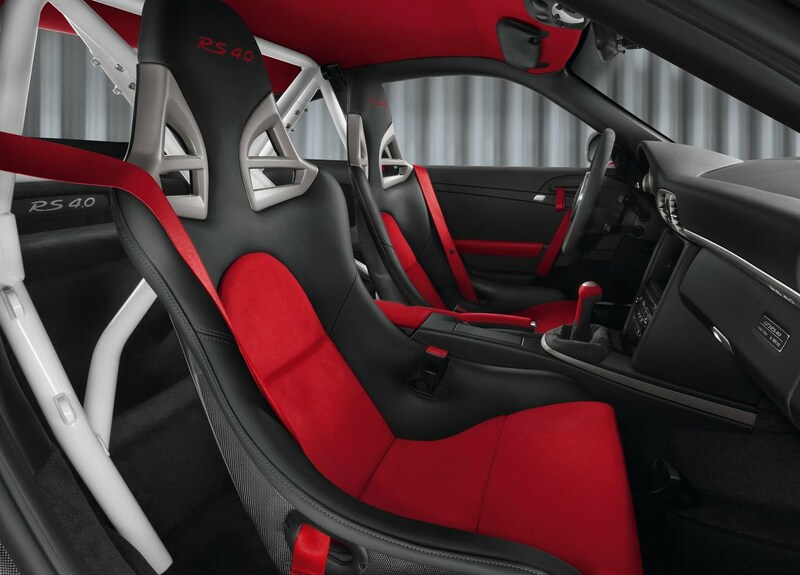 In conjunction with the Clubsport package the lightweight carbon fibre bucket seats are clad in black leather and, depending on specification, a seat centre section in red or black Alcantara. The "RS 4.0" lettering is embroidered on the headrests. Both sports bucket seats with folding back rest and adaptive sports seats are available as an option on the Porsche 911 GT3 RS 4.0 at no extra cost. These optional seats feature thorax airbags located in the seat bolsters. Other exclusive details of the new Porsche 911 GT3 RS 4.0 are carbon finish door entry guards with the lettering "RS 4.0". This lettering is also to be found on the rev counter in the instrument cluster, on the rear floor carpet and on the decorative moulding on the dashboard above the glove compartment. The badge proclaiming the limited edition status is positioned on the glove compartment lid. The cup holder has been discarded on the grounds of weight. To optimise the weight yet further the RS 4.0 can also be ordered without air-conditioning and radio. The interior equipment and the audio system on offer are attractive options such as for example leather/Alcantara upholstery in black, cruise control, Sound Package Plus, Porsche Communication Management (PCM) with navigation system, telephone module and universal audio interface.